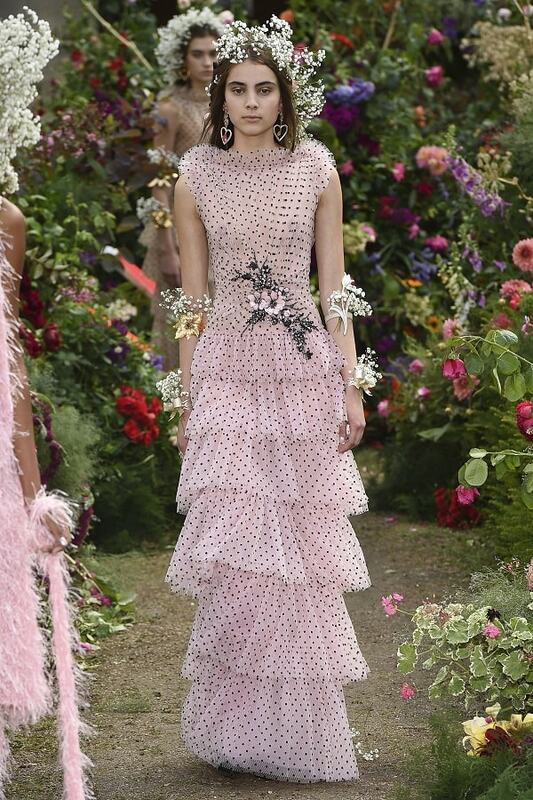 for urban women | a blog by blair villanueva: Rodarte Spring is All Tulles, Ruffles, Polkas Dots, and Lots of Baby's Breath and It's Magical! 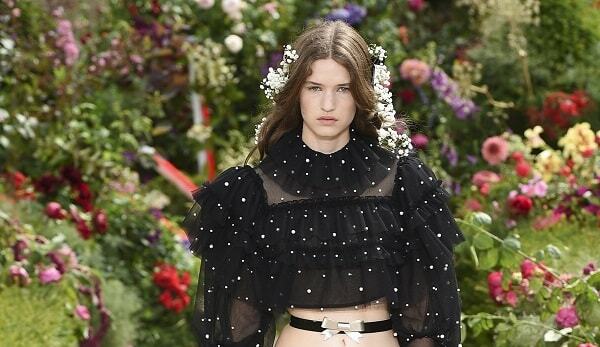 Rodarte Spring is All Tulles, Ruffles, Polkas Dots, and Lots of Baby's Breath and It's Magical! 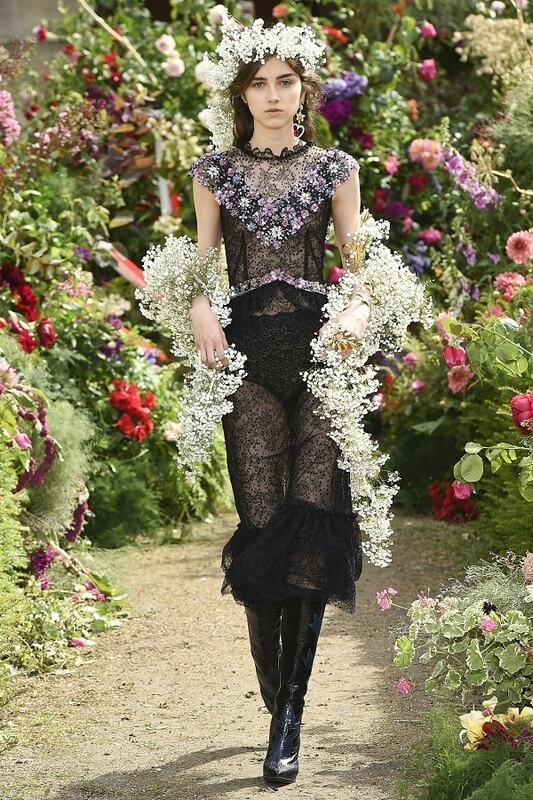 Rodarte Spring 2018 collection was staged in the 16th-century cloister of a hospital and finished with the models standing in formation in an orderly French garden (made disorderly by off-kilter installations of English roses), fully exposed to the elements. It had been raining for much of the day; this was a high-risk move. Tulle dresses and separates, manipulated and embellished in every possible way: studded with pearls, caviar beads, ostrich feathers, polka dots. Leather motocross jackets, cut cropped but full, pierced with yet more pearls. Delicate floral-print chiffon dresses and jumpsuits. A fluttery cape and jumpsuit covered in massive 3-D sequin blooms (trend note: this is already the week of the fully decorated catsuit). And a palette that ranged from the palest, purest pastels (sky blue, carnation pink, butter yellow) to vivid magenta, scarlet, and lemon. Sweet yet menacing . . . as one might expect from a Rodarte offering (said Laura Mulleavy, “This is the most Rodarte show we have ever made”). 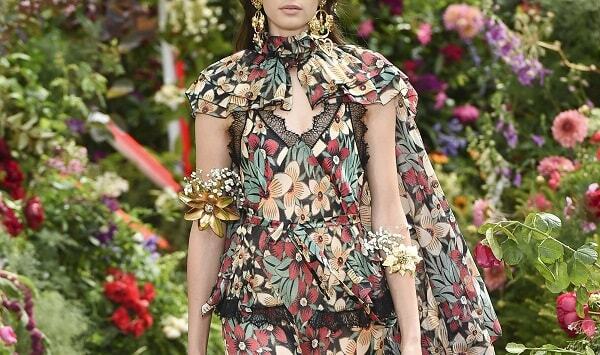 For every delicate gesture, every fluttering camisole, and skirt of asymmetric tiered ruffles there was a gutsy countermove: snakeskin and leather high shaft boots, stacks of gold arm cuffs in the shape of flowers or hearts, and shoulder-dusting earrings. But mostly there was baby’s breath—yes, real baby’s breath—which traditionally plays the role of the crowd when red roses star in prom corsages and bodega bouquets. Models’ hair was covered in it, as were a few of the loveliest dresses, and many of the girls walked the runways dragging massive bouquets of the white fluff behind them. (Joseph Free, the Los Angeles floral designer who has collaborated with the sisters on previous collections, flew in from the West Coast to style the baby’s breath). 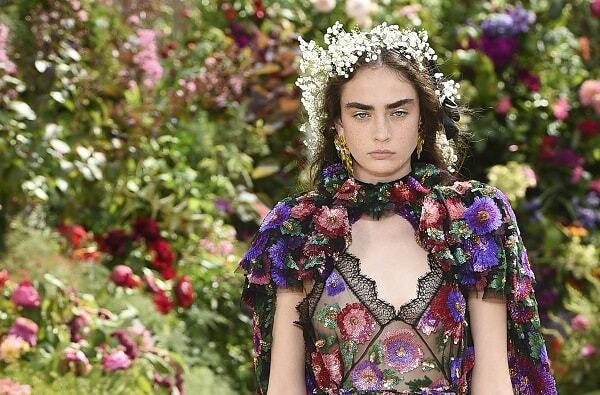 This was perhaps the most Rodarte gesture of the day: to remember and elevate the beauty of something so common, so prevalent, and so deeply associated with the romantic imagination of young women. They have done this before with laddered tights, inexpensive charm bracelets, and the beaded appliqués of accessible formalwear. They know well, and value, the dreams and preoccupations of young women, and understand intuitively how to make something very precious out of that which is most precious. 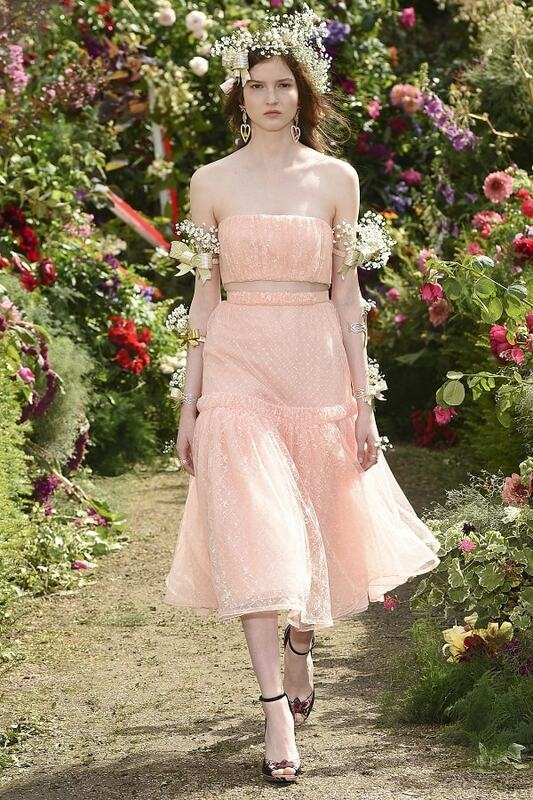 Love the collection so much, long dress make girl look elegant,. I have been looking for ruffles long skirt long time. Until now cannot find suitable one. 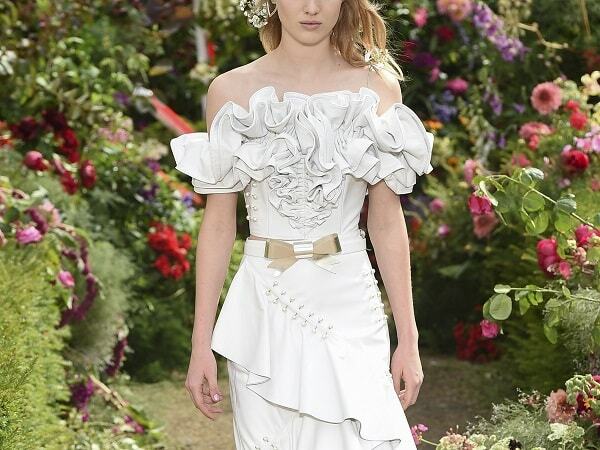 Serious that ruffles dress look gorgeous. I super agree! Now time to hunt for those babies breath flowers. I'm in love with this collection! Now sure if I can wear them as prettily but I still want them all! Very feminine and even I can't stopped staring at them. I like some of the dresses in this collection. Some look very weird. LOL Yeah that's cool too! Thank you for visiting dear! I agree, laces is a sign of femininity and it will always in style. But sometimes its kind of tricky to use. wahhh, so pretty. And all the flowery background as well. The one in yellowish hue is so daring yet elegant at the same time. 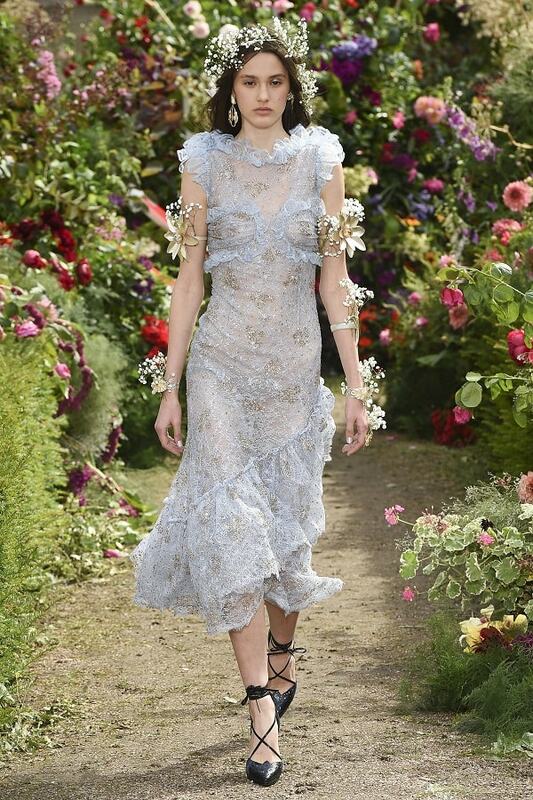 Congrats Rodarte. LOL I agree, kidding aside my boyfriend will definitely like it me wearing it, but definitely wouldn't be allowed to do out the house.